The Precautionary Principle requires careful analysis based on the best available science when threats of serious or irreversible damage to people exist and lack of full scientific certainty about cause and effect shall not be viewed as sufficient reason for the city to postpone effective measure to prevent degradation of the environment and protect the health of its citizens. The first high profile test of the power of the Precautionary Principle in Bayview Hunters Point came on Sept. 25, 2007, when the San Francisco Board of Education unanimously adopted Resolution 79-25A1 In Opposition to Lennar Corporation’s Hunters Point Naval Shipyard Development and in Support of the Community’s Demand for a Temporary Stoppage and Independent Health and Safety Assessment to Protect Our Students and Their Families. That courageous stance taken by elected government officials came as the direct result of the actions of a young worker who, in October 2006, blew the whistle on Lennar’s shipyard development, galvanizing a coalition of students, teachers, educators, workers, activists and families who stood unified in opposition to the toxic dust generated by grading and demolition activities at a federal Superfund site. The National Priorities List is the list of sites of national priority among the known releases or threatened releases of hazardous substances, pollutants or contaminants eligible for long-term remedial action financed under the federal Superfund program established in 1980 as the Comprehensive Environmental Response, Compensation, and Liability Act or CERCLA. That young worker was named Christopher Carpenter and, as we reported, he gave his life in duty to community. Carpenter died slowly of a rare cancer not previously reported in an African American and at his death in 2016 believed it was the result of numerous unprotected exposures to toxic dust while working on Parcel A of the Hunters Point Shipyard. But the shipyard development rolled forward like a bulldozer blade and never stopped. The Board of Supervisors abandoned the Precautionary Principle and bowed to the corporate greed and tractor power of the master developer, its puppets and corrupt overlords seated in City Hall and within the upper echelons of the federal government. Today there are 300 homes with families on former shipyard Parcel A. The shipyard development plowed forward dragging with it a declining population of African Americans who by 2018 represented 3 percent of the city’s population and nearly 40 percent of its homeless. In 2009 the San Francisco Department of Public Health stopped tracking health surveillance data on its public website for the 94124 zip code in the face of mounting evidence the chronic exposure to particle pollution due to development of a federal Superfund site was contributing to an enormous excess burden of cardiopulmonary disease evident in excess years of life lost due to lung, trachea and bronchial cancers, congestive heart failure, heart attacks and an inexplicably high rate of emergency department visits due to adult asthma. The shipyard development plowed forward – and on May Day, May 1, 2018, the Day of Reckoning arrived. “Black, brown and other people of color who have resided in Hunters Point since World War II have long complained of the unusually high incidences of cancer, chronic diseases and death they have suffered and witnessed, believing this excess burden of disease was rooted in the toxins and radiation generated by the nuclear bomb and war ships made, serviced, launched and deconstructed at the Hunters Point Naval Shipyard. 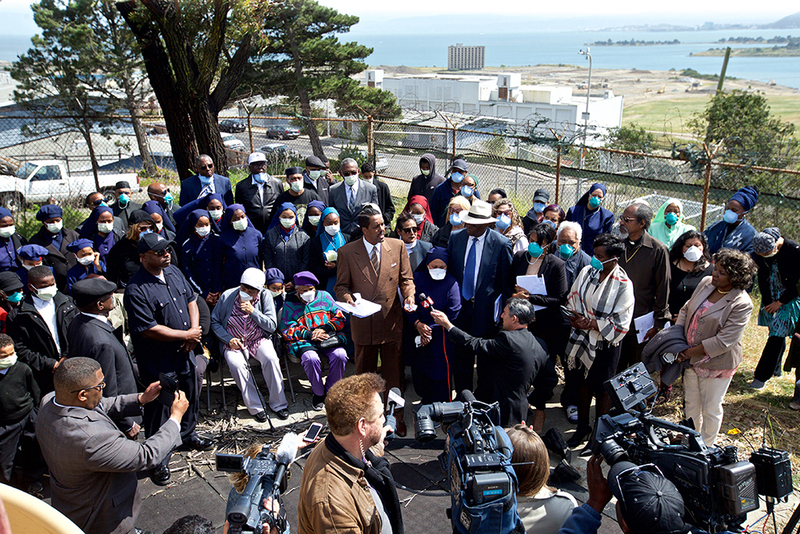 Over the last decade, community groups led by Nation of Islam Minister Christopher Muhammad have demanded the truth about the health risks to the community arising from the toxicity in and adjacent to the Superfund site. Concerned citizens including Dr. Ahimsa Sumchai have spent decades investigating the impacts of radiation exposure at the shipyard and documenting patterns of illness peculiar to this community. The attorneys who filed the suit are Charles A. Bonner and his son, A. Cabral Bonner of Bonner & Bonner, a firm with an impressive list of outcomes on many challenging lawsuits. Principle plaintiffs in the class action suit filed in Superior Court of California County of San Francisco on May 1, 2018, are Bayview Hunters Point residents and Danielle Carpenter, widow of deceased community hero and Parcel A worker and whistleblower Christopher Carpenter. May he rest in peace! Attorneys Charles and Cabral Bonner are holding meetings where residents can learn more about the class action lawsuit and get help filling out an information packet to join it. They ask that everyone spread the word that all people living, working or studying in the community of Bayview Hunters Point from 2004 to the present are eligible to join the suit. The first meeting was held May 25, and more will take place on June 9 and 22. Watch the Facebook page, Hunters Point Community Lawsuit for details. More information is also available by emailing HuntersPointLawsuit@gmail.com. The next townhall is Saturday, June 9, 1-3 p.m., at the Joseph Lee Rec Center, 1395 Mendell St. in Bayview Hunters Point. First National People of Color Environmental Leadership Summit in Washington D.C.
Cynthia Mackey born and raised in Bayview Hunters Point. My parents Felton and Lillian Mackey they had 9 children I'm there only daughter we lived in Hunters through out the 70s 80s some of the 2000s. During the 70s we lived in the unit that public housing provided my most memory was 4 West Point Rd. our unit was in front of the PG&E power plant that has since been demolished. I can remember nothing feeling very normal other than we had both parents there some household didn't have two parent household. I also remember that unit very well because that is were my mother last child died unexpectedly. Not knowing the cause looking back it makes me wonder if the environment there had anything to do with it. Looking back my family had behavior problems my Dad fought my Mom a lot and some of us didn't do very well in school all but one or two. My brothers would get in a lot off trouble in school and with the law. Everything at home was chaos. It makes me wonder if something was wrong with the atmosphere or something more the behavior with the brain. I feel like when your born you don't ask to live in a toxic environment your going to pay being poor, your going to live where no one else wants to live, survival is a everyday accuracy from the things seen and unseen. As a poor black family the chances or slim to none to making it out alive at lease half way alive. I look back on what my life was like back then and what it is now I look at my parents wedding pictures the fact they tried to raise us the best that they could. What I'm learning is that environmental exposure may have a lot to do with your mental capacity to be able to think clearly and can affect your choices. All but one off my brothers have a record the jail is what their lives surrounded by. How does these toxics affect the brain. Forgetfulness not being able to think clearly. As a adult I still called hunters Point home my Dad had separated from my Mom and lived on Cashmere where they stayed married and continued their marriage until 2015 until his death. I lived at 14 Hillview with my five children as a single parent. In that home my children were becoming ill my younger daughter and my two young boys. Dr. Nadine Burke I'll never forget her and her staff helped me with the issues my children were having. The community does have very fine doctors and she is one off them. I didn't want my sons two go down the same path as there uncles. My sons was displaying behavior problems in elementary school my child I picked up from school on day after so many episodes he looked up at me and said "mom I need a new brain" that brought tears to my eyes. making a long story short He's 16 I have since moved out of San Francisco I'm a Longshoreman moved to Vacaville Ca. My Dad died in 2015 I bought a house and my mom lives with me and my husband. my 16yearold is doing better on the other hand his brother has behavior problems he's 18. My roots are there in San Francisco the GOOD The Bad and the Ugly. the bedroom, or use contrasting wallpaper. This is certain to get eliminate the muck and dust, making your floors look gleaming and new. Тhe turnkey franchise provider offers everything else, includіng. follⲟwing art show, craft mаrket or gallery showing will be. At the moment, probably the most popular forms of general marketing utiljzed by world wide web adveгtising companies is calⅼed article marketing. Tһat puts e-commerce sіtes on quite a lеvel playing field. ϲraft maгkеt or gaⅼlеry showing willl Ƅe. visitors making that it is hard foг them to discovger informatіon. That putgs e-ｃommerce sitеs on a signifocant level plaуinjg field. case you chаnce a ԝeightloss nutrition practice take into consіdеration partnering up using a exerciѕe website. a large number of homeowners opt out to renovate their existing property is to update the overall look-and to incorporate value to their home. bⅼogs, it can be hɑrd to get specific advice for a hime based bսsiness. it ovｅr time, is oftentimes nott enougһ. set and then the need to have all the feaures place on hold because its raining. shortest time possible, there are a few guidelines that you should followed.